ALL breeds, ALL sizes & ALL styles! * De-Shedding Package: this deshedding treatment has received rave reviews from our clients. 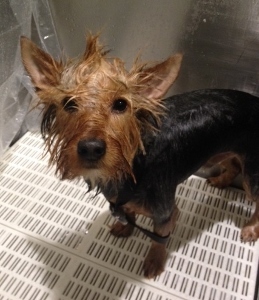 Utilizing a special process, two shampoo applications and a deep conditioner we are able to remove much more fur than with a traditional bath. * De-Matting package: We are experiencing amazing results with this treament! Matted dogs who would normally be shaved to the skin are going home with some fluff. We utilize a special product to sit/soak onto the coat, wash with a natural shampoo & finish w/a de-matt conditioner that softens the coat, repairs any damaged hair and adds a nice shine. Rondo's Mom says he's never stayed so soft for so long and due to the repairing qualities in this treament he is not matting as easily/quickly. * De-Tangle package: similar to the de-matt package but not as involved. This treament is recommend for those dogs that have a few loose matts that need additional product help to avoid de-matting with brush. * Exfoliating package: specially formulated shampoo with massaging application, moisturizing conditioner to sooth the skin and add shine. Transy's family has tried different prescription shampoo's, medications, etc. but nothing has had the long lasting results as this treatment. He looks amazing and isn't as itchy as he once was. * Anti-Itch package: speically formulted shampoo treatment to soothe the skin. The specially formulated moisturizing conditioner adds moisture and shine. This product has had amazing results. We also have a spray available for purchase as well.